Where most soccer games concentrate on the players, Luca: The Dreamer creates a world in which a ball itself has dreams and ambitions. 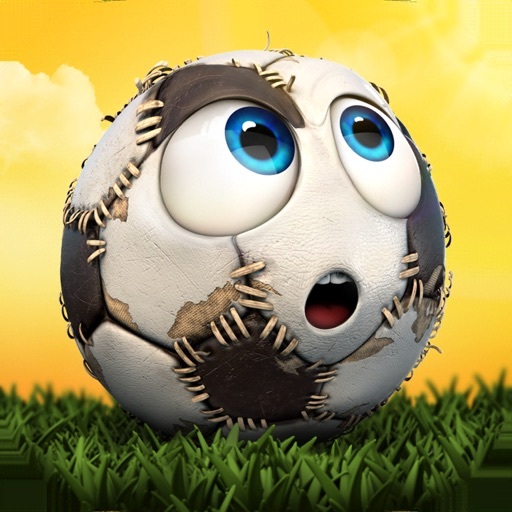 As a result, you get to play a soccer-themed puzzle-platformer starring a fun, bouncing orb instead of a boring old human. It all starts on the streets of Rio De Janeiro, Brazil. Luca the football is enjoying a game of soccer when a wayward shot sees him soaring over the crossbar and through the window of a nearby flat. As he flies through the air, amid a shower of broken glass, he happens to catch a glimpse of the World Cup on TV just as a cocky-looking ball with an expensive haircut is rocketing into the back of the net. At that moment, Luca vows to cross the globe and reach Russia in time to be the game ball for the World Cup final. And you have to help him. Your journey to Russia takes you through 12 levels and three chapters, covering every kind of environment from the beach to rooftop, city to sewer, all of them gorgeously rendered in beautiful, Pixar-esque graphics. You need to bounce and roll through each stage, dodging hazards, solving puzzles, and finding your way to the end. To finish a level you’ll need to collect coins. Most of these are scattered along the path, but many are out of the way in seemingly inaccessible places, or difficult to spot at first. To scoop up all of the coins you’ll need to solve some fiendishly difficult environmental puzzles, mostly involving boxes that you need to shift or smash open. Think Limbo or Leo’s Fortune. Thankfully, there are a number of smart features to make your life easier. For instance, there’s a hint system in place for the first four levels to help you find your feet (or whatever a ball’s equivalent of feet is). Plus, you can zoom-out using Observation Mode to find bonus coins in secret places. These green talent coins give Luca Mario-esque special abilities, such as a double-jump, a wall jump, and super speed. And don’t worry if you can’t get every single coin in a level. You only need to collect 500 out of 600, so there’s some leeway for players who just want to reach the next stage. There are also checkpoints in each stage. Whenever you pass through one you’ll get a little celebration, in the form of confetti, party poppers, and an encouraging little chant from Luca himself. Reaching a checkpoint means you’ll start from that point in the level from now on, with every coin safely banked. Obstacles in Luca: The Dreamer are subtly highlighted to help you avoid them. As long as you keep your eyes peeled for a faint red glow or a glittery sparkle you should be able to steer clear of hazards such as broken glass and fire. You also need to beware of animals, such as crabs and rats. Contact with one of these creatures will cost you, so you need to proceed carefully and observe their movement patterns. Luca: The Dreamer promises to a solid soccer-themed adventure, with polished visuals, high-quality music and sound effects, challenging puzzle-platformer gameplay, and a world-hopping variety of environments to visit. Grab it on the App Store and Google Play now.